***As a member of the Wholly Guac Squad I will receive complimentary product vouchers in exchange for sharing the following promotion. Regardless, all photos below are original and copyright Momma Told Me Blog 2013. Momma Told Me: Add a little fun. When you're a kid, everything revolves around fun. You recoil from anything called 'work', rebel against rules set in place to keep you healthy (such as bed and nap times), and reach first for the foods intended to be enjoyed in moderation. Crafty parents have been circumventing this system for years with clever ways to disguise that which is best. Whether it's turning a simple chore into a time based game, rewarding a good grade with an ice cream sundae, or carving healthy snacks into adorable characters; it's all been done in the name of love. From my very first school lunch, to my very last in high school, my father would make an effort to turn my lunches into positive pieces of encouragement. I'd rush to open my lunch pail at snack time and scour the wrapper folds and Ziploc seams for notes of love and doodles written in Sharpie. It's something that has stuck with me to this very day, and a tradition I hope to continue with my own kids. 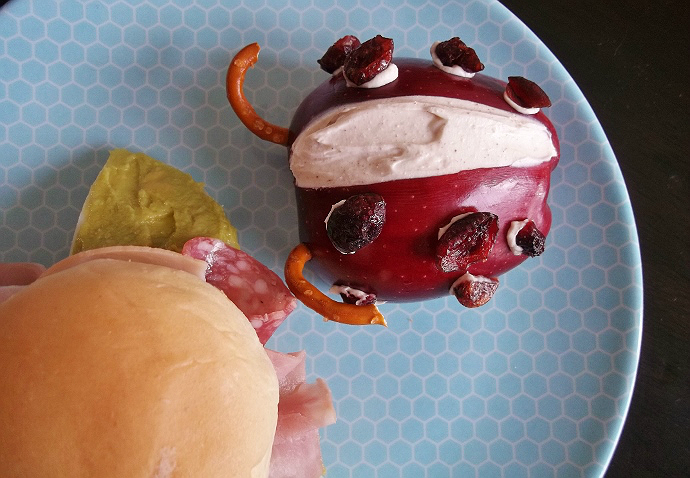 Making lunch fun, and delicious, isn't as difficult as it may sound. Learning smart substitutions, like fresh berries instead of fruit snacks, or guacamole instead of mayo, will keep your child's meals tasty and healthy. I would have never been able to enjoy guacamole at school as a kid, but Wholly Guacamole's new Minis offer a brand new way to take delicious avocado infused guac on the go. Similar to my favorite Wholly 100 calorie snack packs, these new easy dip, peel and enjoy, single-serve cups offer the same amount of calories in a kid/lunch friendly package. I've been scouring the deli cases at my local supermarket just waiting for these new Minis to turn up; in the mean time I've been sharing the guac love by participating in the #OMGuac Your Lunch photo contest. 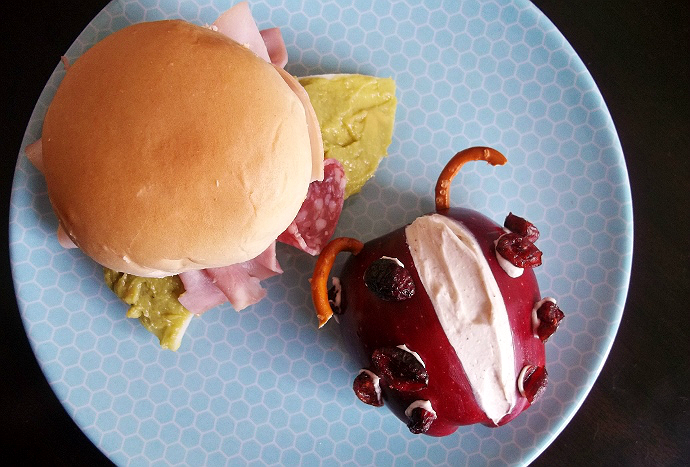 Inspired to 'Get MY Guac On' I threw together a great kid themed lunch with some basic ingredients typically found in our household; Craisins, Cream Cheese, Pretzels, a Red Apple, Mini Bun, Deli Meat, Cheese Slice (provolone), and of course Wholly Guacamole (original). I halved the red apple and cut a slice out of the middle to create a gap for the 'wings'. I added a pinch of brown sugar and a pinch of cinnamon to 2 TBSP cream cheese and spread it inside the missing slice crater. I then used a pretzel for antennae, and 'glued' the Craisin 'spots' on with the leftover cream cheese mixture. For my 'Flower' Sammy I layered deli meat slices like petals atop two halves of a Provolone slice smothered in Wholly Guacamole for 'leaves'. 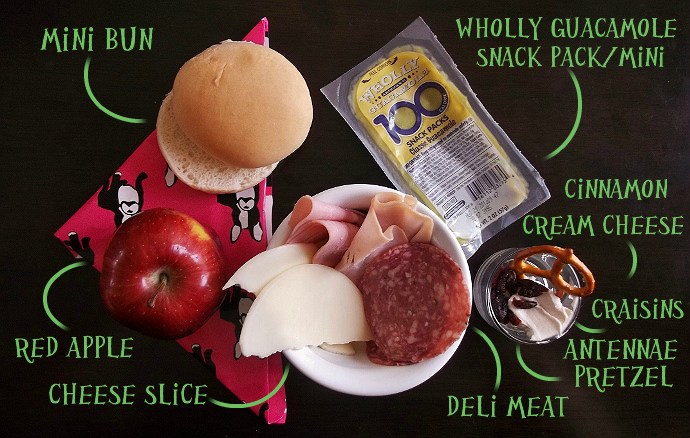 Not only is this lunch adorable, but it's well rounded too! Keep an eye out for the new Wholly Minis on a shelf near you, and be sure to stop by the OMGuac contest to check out all the great lunch ideas each week! What Daughter Says: Help keep your kids strong and full this school year with creative lunch idea and Wholly Guacamole. What an adorable lunch. I honestly never would have thought of that! That lunch is awesome!!! I am so hungry now! Aaahhh, how adorable is that lady bug cupcake!!! I LOVE IT! I love the ladybug apple - too cute for words! 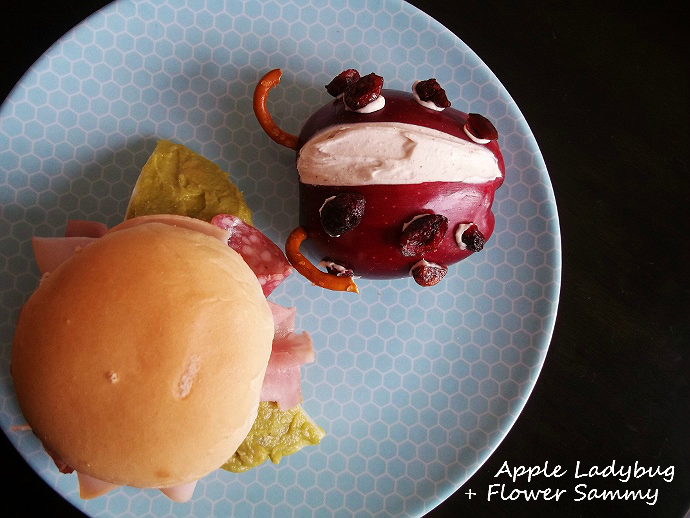 The lady bug apple is so cute! I bet all the other kids were jealous when they saw this lunch! :) Great post, and thanks for sharing at Show Stopper Saturdays! You are insanely creative. Sometimes I think you should be a food stylist! Wholly Guacamole is one of my favorite dips and the 100 calorie packs are genius. That is so adorable!! I feel like I am always in such a rush to throw their lunches together. Plus, I am not nearly as creative as you! I love it. I love the Lady Bug apples idea, to cute! Where do you come up with these ideas? That lady bug apple is just the cutest thing! I am pinning for the future. how darling! i wish kids were little!